I'm a prisoner. I'm at work. Probably many feel that way. I feel that way because while I'm on assignment I live at work to be available for the emergency on-call. So as any prisoner would do, I find a way to take myself to a happier place in the moments I have to myself and, for me, that is research for an upcoming costume event. And what is upcoming? 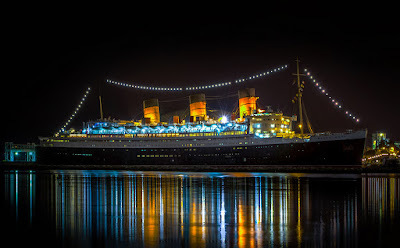 The Art Deco Festival on the RMS Queen Mary in Long Beach, California in mid-August! I'm so excited! The Art Deco Festival events are back-to-back over three days and include a Double Decker Bus Tour, Captain's Strolling Art Walk, Welcome Reception, Cocktails in Historic Places, Deco Pajama Derby, Bootlegger's Bash, Golden Era Travel Showcase with vintage autos on the wharf, Soda Fountain Tasting, Prohibition Mixology, Gatsby Daze Garden Party, Historic Starlight Club Revival, Swingin' Sunday Tea Dance, Sir Winston's Cocktail Hour, Art Deco Movie Night, Vintage Bazaar, six Lectures, and the Art Deco Grand Ball! Is that not the most incredible line-up of events and a pure dream for a costumer? To end this glorious trip I will be joining friends at the Huntington for a tour and tea in the Rose Garden. In costume, of course! This is a new costuming era for me and has taken quite a bit of time to research and plan. Since I'm imprisoned *smile* and only have access to what is on my phone or the cloud, I'll share my Costume Plan A with you. 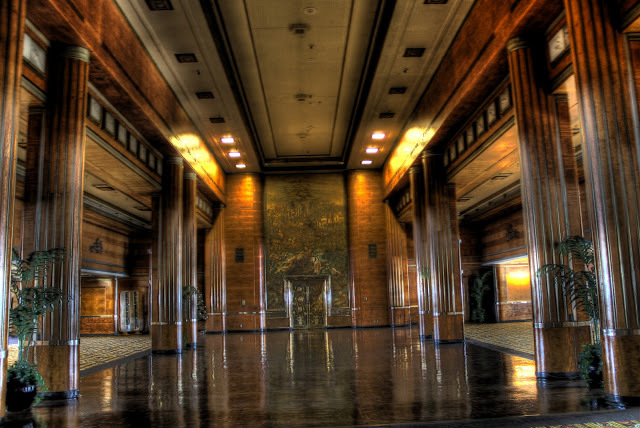 Art Deco (/ˌɑːrt ˈdɛkoʊ/), or Deco, is an influential visual arts design style that first appeared in France just before World War I  and began flourishing internationally in the 1920s, 1930s and 1940s before its popularity waned after World War II. It took its name, short for Arts Décoratifs, from the Exposition Internationale des Arts Décoratifs et Industriels Modernes (International Exposition of Modern Decorative and Industrial Arts) held in Paris in 1925. It is an eclectic style that combines traditional craft motifs with Machine Age imagery and materials. The style is often characterized by rich colours, bold geometric shapes and lavish ornamentation. 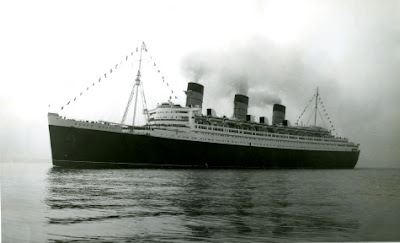 Although the RMS Queen Mary was commissioned in 1936, I have decided to focus on the 1920s for my Art Deco Festival style. During my research I found a pattern designer in Spain who distributes through etsy. 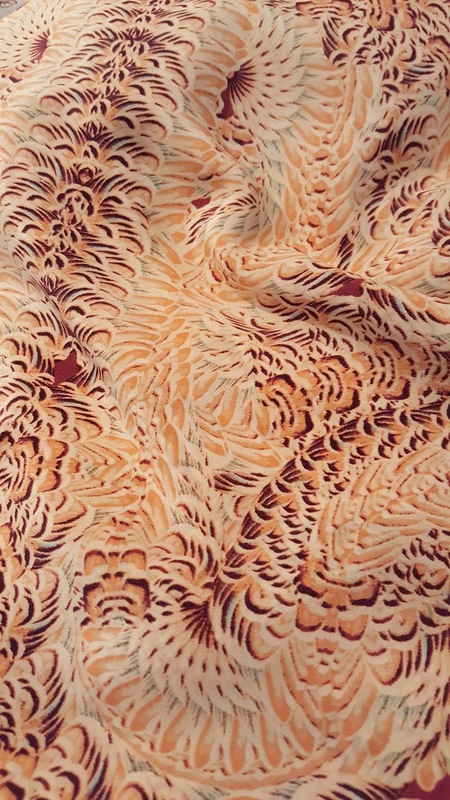 She makes standard-sized patterns, but will also create a custom-sized pattern. I fell in love with her style and first bought this pattern a while ago. I love everything about this dress and hat! There is a fabric store nearby which is closing it's doors forever (very sad) and they had the most luscious pure white sateen on sale. I am going to make this dress with the sateen with a red satin trim on the collar and hat. I will cover the buttons with red satin and found some not-exactly-period but inexpensive and perfect color shoes on ebay. This should be a wonderful boarding costume and I think perfect for the Welcome Reception. 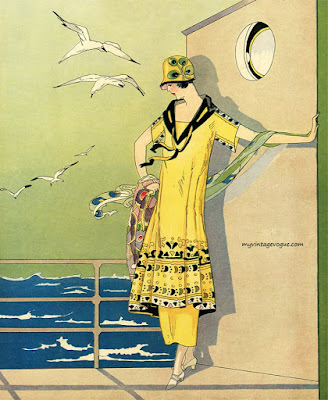 Looking at the Historical Sew Monthly Challenges, I found 3 costumes that will help me meet those challenges with dresses for the Art Deco Festival. First, a 1930s pattern from Eva Dress with a beautiful drapey fabric found in the Fabric District of LA during Costume College 2015. This will be used for Challenge #6 - Travel. The lightness of the dress for packing and also for the heat of California in August make this the perfect dress for the Double Decker Bus tour. This is an in-progress photo and I will be taking finished photos with accessories as soon as I'm home. The Historical Sew Fortnightly Challenge for this month is Monochrome. Although black, white, and grey would fit the challenge, I'm using the broader definition to mean shades of the same color. 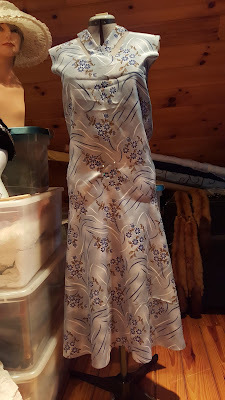 Contrapunt on etsy had this Cocktail Dress pattern and while I know they will be a challenge, the pleats are so stylish. 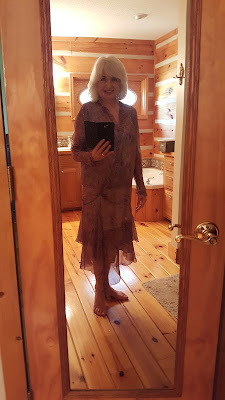 Fashion Fabrics Club had a wonderful sale and this silk crepe de chine in a mocha color is the perfect fabric to blend with my American Duchess Seabury shoes. The headpiece for the Cocktail Dress will be a simple band of roses made from the same fabric. Easy, cool for the hot weather, packable. Wish me luck with these pleats! The Art Deco Festival has a facebook page and this beauty was posted there one day. Inspired by the dress design I found this pattern by Contrapunt on etsy. 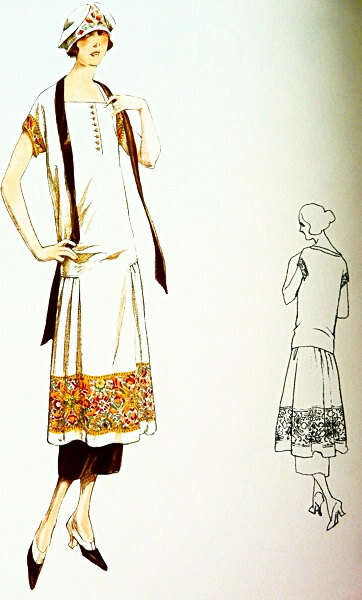 Of course I adore the little hat in the pattern rendering. I've made several cloches and am still wondering how to make those amazing little "wings". That will be my dress for the Swingin' Sunday Tea Dance. I have a sweet friend who is extraordinary when it comes to vintage costume. 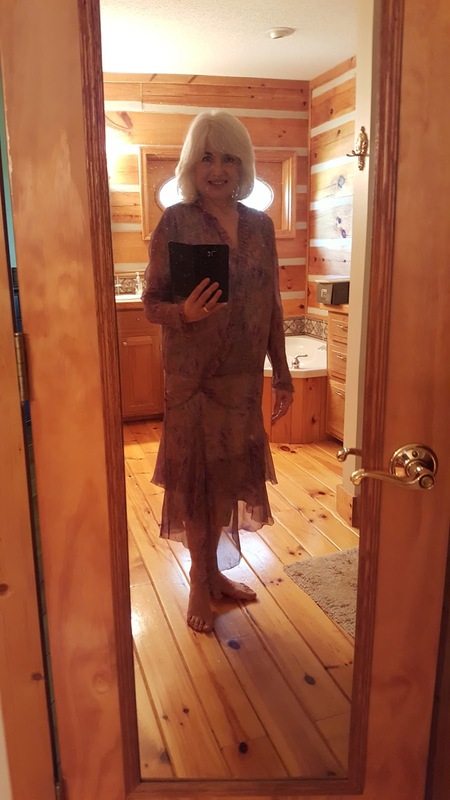 We have attended many events together and to my tearful pleasure she gave me a gift of a vintage chiffon day dress. This is the only photo I have of me trying it on the day it arrived. The colors and details are extraordinary! It will have a special wearing at the Gatsby Daze Garden Party. In 2014 I made a hat for a Historical Sew Fortnightly challenge and will switch out flowers and wear this hat several times during the Art Deco Festival. It will be lovely and breezy with the vintage chiffon dress at the Garden Party! The other dress that this hat will be used with is another Contrapunt pattern. 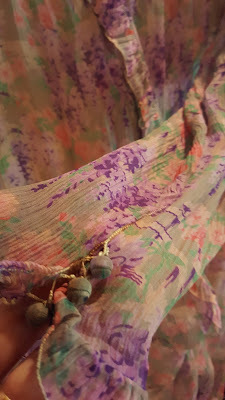 I found a peach and turquoise silk crepe de chine and it will be a very wearable dress for a day at the Huntington and tea in the Rose Garden. Yes, more pleats! After the costume event I had organized at Biltmore Estate in April I was trying to choose between several Costume Events on my Bucket List. I didn't have the financial resources for all of them (do we ever?!). As I trolled eBay I stumbled upon this exquisite coat. Does that not say Art Deco? This coat told me that the universe thought I should attend the Art Deco Festival. It was a Buy It Now and that is exactly what I did. 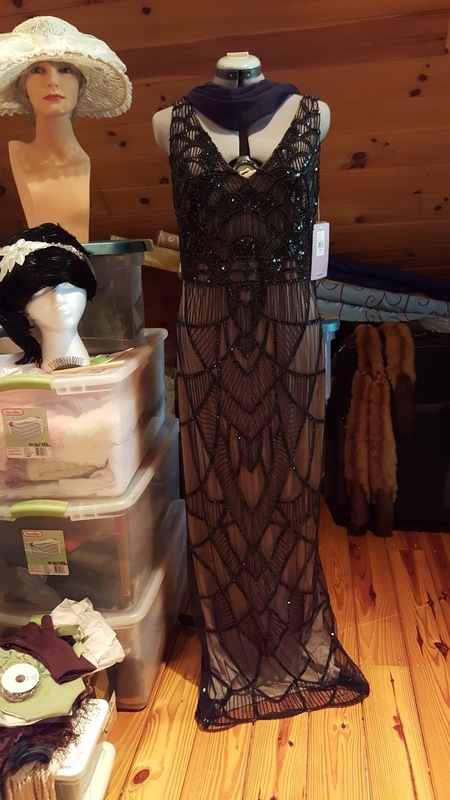 It will be my coat for the Art Deco Grand Ball and I will pair it with an off-the-rack gown. Not very creative on my part but I think it will fit the style nicely and it certainly fit my budget at half off. Yay!! Just before bed on work evenings I sit with my tablet and do extensive historical research. Well, not really! What I do is watch Miss Fisher's Murder Mysteries on Netflix. She has the most wonderful 1920s dresses and accessories! While they may not always be historically accurate, they are fun and fabulous and I fell in love with this shawl. If the universe allows, I shall have my own recreation of this in August. 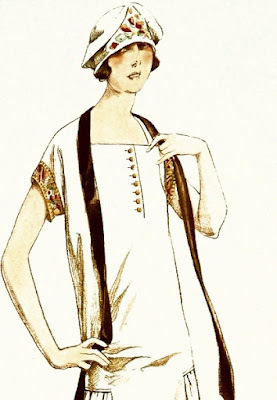 Miss Fisher is also my inspiration for the Art Deco Pajama Derby. A bit more of a lounge outfit than pajamas, I have the perfect pieces from the 1980s corner of my closet to imitate Phryne in this cute photo of her and Jack. And there you have it! Plan A. What is Plan B? Capri pants and tank tops and a week on the Queen Mary in August. 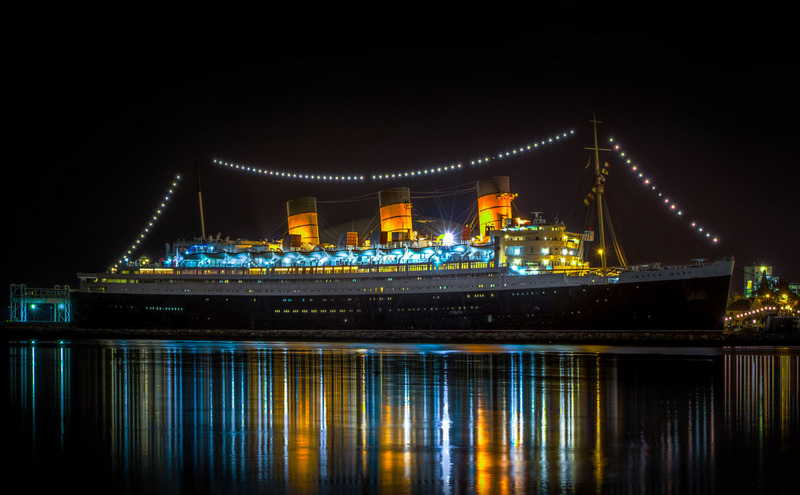 Whichever Plan, A or B, it will be incredible to spend time in the history of the RMS Queen Mary!